What’s it like to stay in a overwater villa at the Hilton Bora Bora Nui Resort? Visiting Bora Bora has always been one of my dreams and I couldn’t have been more happier to learn that our Tahiti & her islands-trip came with a couple of days exploring this mythical island. To make the experience even more unforgettable, we stayed at the Hilton Bora Bora Nui Resort & Spa. I had big expectations of this resort and couldn’t wait to check it out. Here is my review. 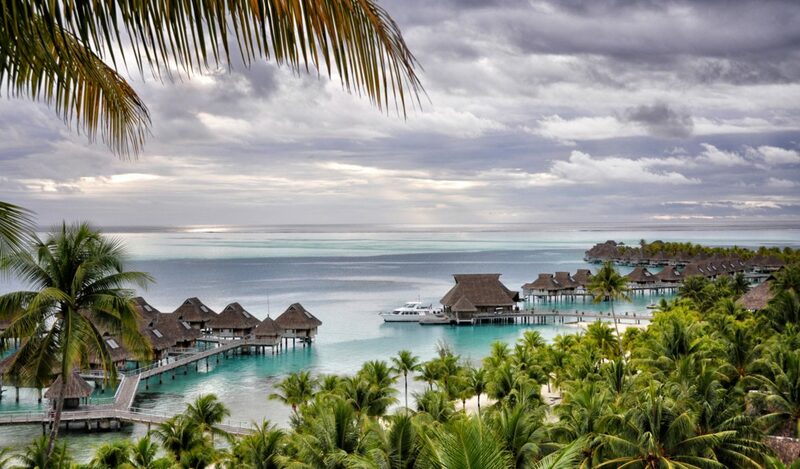 The Hilton Bora Bora Nui Resort & Spa is located on a paradise perfect beach and a stunning blue lagoon. Some say this is probably one of the best locations in Bora Bora and although I have only seen part of the island, I’m sure this must be true: the setting is amazing! We were picked up at the Bora Bora airport (situated on the islet of Mutu Mutete) by a private catamaran and arrived a short 30 minutes later at the hotel. The hotel lobby is built over water, which makes the arrival even more spectacular. Check-in was quick and efficient and already 15 minutes later were were ready to go to our room, or better: our overwater villa. I was stunned by the size of it! There was a separate living room and bedroom, two plasma TV’s with DVD player and a gigantic Italian marble bathroom with soaking tub and a separate shower. The floors in the living room and terrace had glass windows (hello colourful fishes!) and outside there were steps leading directly into the water. …there is another one in the livingroom. Big bathroom. Always good for a mirror-selfie. But best of all: the view outside was picture perfectl! I looked over a smaller crystal blue lagoon with Bora Bora’s tropical hills and volcano peaks in the back. Ow boy, this was one villa I never wanted to leave again. There are two restaurant. The main restaurant is the Iriatai Restaurant (Iriatai meaning ‘on the surface of the water’) where you can choose between a mix of Polynesian, Asian inspired and Mediterranean specialties. On Friday night there is a delicious Mediterranean buffet to enjoy. The restaurant has also amazing views over the lagoon surrounding Bora Bora. My favorite: a seafood curry. The Tamure Grill is a relaxed, barefoot-in-the-sand-restaurant where you can enjoy your breakfast buffet, lunch or dinner. Smaller snacks and cocktails are available at two bars: the Upa Upa Panoramic Bare (posh) situated on the hillside and the Ta Ie Ie Beach Bar (casual, near the pool). If snorkeling and other water sports doesn’t get you into shape, there’s a modern fitness center to check out. But if it’s your body ànd mind that needs pampering, you should try the Hina Spa, nestled on a hilltop. The spa has a couple of treatment rooms and offers Pacific-inspired beauty treatments and massages, but what you really want is the ‘Million Dollar View’-experience: a two-hour open-air treatment in a serene and secluded pavilion overlooking the lagoon. Best place in the world to enjoy a massage, especially when the sun sets. Wi-Fi in the room is available but expensive, but you can use free Wi-Fi in the lobby. We think this place is perfect for couples, romance is all around. Still, children are very welcome: the restaurants serve children’s menus, there are lots of things to do for kids and there’s a babysitting service available. You can book a lot of excursions and activities through the hotel, at reasonable prices. It’s a large resort and there are hills and stairs to climb. If you don’t like to walk a lot, there are electric carts available. The shuttle ferries to and from Vaitape (the largest city of Bora Bora) runs throughout the day and well into the night: perfect if you want to have diner on the mainland. Big bonus: the hotel has its own private ‘deserted’ island: Motu Tapu, the most photographed islet in the South Pacific and the best place in the universe to have a romantic dinner. The Bora Bora Hilton offers several types of rooms and villa’s. The standard rooms in the main building have garden view, but the luxurious hillside-, garden- and over watervilla’s are a better choice: if you’re going to stay in a place like this, you might as well do it right. For those who have some (or better: a lot) money to spent: the Presidential Overwater Villa has a private pool and whirlpool on deck, 3 bathrooms, 2 dressing rooms and a wellbeing room (with sauna!). This is an expensive place to stay, especially if you want to book a luxurious overwater villa. There are special offers available, check out the rates on the website as these change during the season (tip: Hilton HHoners is the Hilton loyalty program for regular guests: become a free member and start saving HHoners Points. It will get you cheaper rooms and/or free nights, a great way to save money). If you’re looking for an exclusive and special place to stay: you’ve found it! Here are some extra pictures. It was a bit cloudy during our stay (but we only had rain one day, and just for a couple of hours) but it still felt like paradise. Update 2017: since my stay the Hilton Bora Bora has been undergoing changes and is now know as the Conrad Bora Bora Nui. The luxury retreat looks even more glamorous now! This is just paradise on earth – it would be an absolute dream come true to have a chance to visit somewhere like this one day – I’m super jealous!! You must have had an incredible time and the hotel looks beyond anything I’ve ever seen! Stunning!! So true Brad, totaly agree on the wi-fi! Wow this place looks incredible! I bet you guys had such a wonderful time. The pictures are breathtaking! Hi Heather, glad you like Belgium! 🙂 Always welcome! Wow! What a beautiful resort…It is undoubtedly a paradise. And anything for that view! Sailing around the islands must have been fantastic! I especially liked the people in French Polynesia: so genuine friendly and relaxed. Beautiful place! I have had this place on my list for far too long but the cost involved means I put it away…but soon! Stunning resort in Bora Bora! There are not many other places around the world that are as luxurious as the island of Bora Bora and this looks like the perfect spot to experience this ultimate luxury. Heather has always wanted to stay in one of those overwater bungalows so I guess I may have to make that dream of hers come true sometime after reading this particular review. Oh. My. Goodness. If I ever get to go there, I would be a very happy girl. I think I need to get either a piggy bank or a Hilton card… absolute heaven! What a wonderful place and your photographs really show it off, despite the clouds. The hillside villas surrounded by jungle look fantastic but the idea of being able to slip into the water from the steps of your own villa (and that view from the decking) edges it for me. I’d be in heaven! OMG. This place looks like paradise. I love watervillas. The ultimate romantic place, may be? Looks great and you have some very nice pictures. Hi Samatha, maybe you’ll get there one day. Bora Bora was always a dream for me too, and it came true. You just never know, don’t stop dreaming! Now that is paradise! I think I’d try to find a way to stay. It’s just during the winter months (pictures were taken beginning December) that it’s cloudy. It does rain a lot during this season (but we were lucky: cloudy but not that much rain). And I agree so much: the Wifi should be included considering the price. Beautiful looking resort. The weather looks much cloudier than I would have expected – is that normal? Yes, during our days on Bora Bora (beginning of December) it got really cloudy but in fact we only had a just couple of hours of rain, so it looks worse than it was. French Polynesia has a raining season (during our winter months) and I’ve been told it can rain for days, that’s something to think about when traveling to FP. We both like to take pictures, and fight for the camera :). The wifi, I know! It really should be included in the price of the room, considering it’s already expensive. The free wifi in the lobby worked find, and it was a nice place to sit, but still, it’s just not as comfortable. 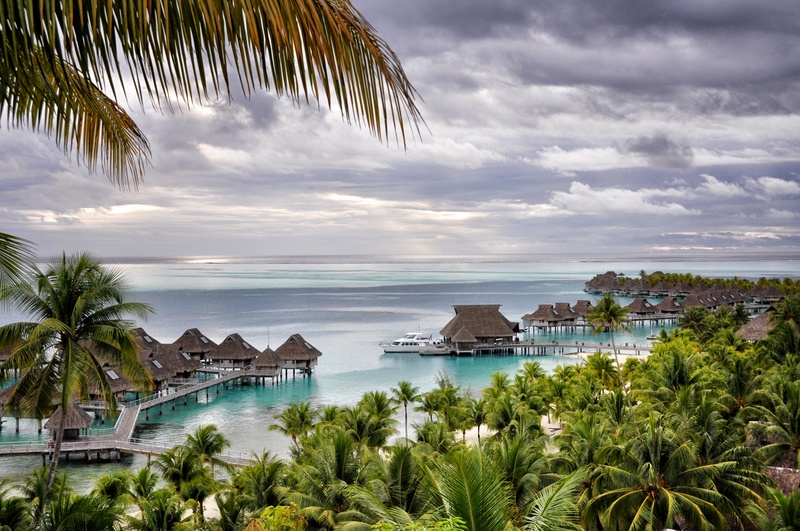 Even with clouds, those shots of Bora Bora are stunning. Definitely an unforgettable lodging experience. Oh. My. God. I need to get there asap!! Okay, wow! Just wow! THAT is paradise! Whoa… now that is what you call luxury! Great post. Yes, I want to be there. Now. Wow! AMAZING! Definitely on my bucket list. Have to start racking up those Hilton points! EuropeThe other Barcelona experience: let the locals show you around!